A mother’s mental and emotional state plays a huge role in how the birth plays out: whether she experiences it as painful, what kinds of interventions take place, and how she shares about the experience with her community. In this piece, childbirth educator Esther Croft shares why the emotional state is so important, and how we can actively support our clients to work on their beliefs about birth. At its core, the HypnoBirthing philosophy is simple: When a mother is deeply relaxed and free from fears and anxieties, birth can proceed without acute pain. In reality though, it takes a lot of dedication and practice to achieve the deep state of relaxation required to have a truly gentle birth. The most important part of this preparation is working on the mother’s core beliefs about birthing and parenting. The reason for this is that humans (like any other mammal), need to feel private and safe during labour for our birthing hormones to work as they were intended. Feelings of anxiety and fear activate the sympathetic nervous system putting us into ‘fight/flight/freeze mode’, which not only slows labour, but also makes it a great deal more painful. In our society it is a miracle if a woman gets to adulthood without taking on the belief that childbirth is inherently painful. We have been taught this since a young age. It’s the way childbirth is portrayed in the media, and it’s reinforced in all of the horror stories that people love to tell us (particularly when we are pregnant). Reducing fears about childbirth is a highly effective way to reduce pain and improve birth outcomes. While physical preparation helps immensely with stamina and strength, in my view it is the emotional preparation that has the most impact on how childbirth is experienced by the mother, both physically and psychologically. One reason our beliefs are so important is because we all suffer from a cognitive bias called the ‘confirmation bias’. This bias causes us to preferentially seek out information that supports our underlying beliefs while also ignoring or misinterpreting information that would disprove those beliefs. Because of this, two people with differing beliefs can experience the same exact scene in very different ways. Behind the scenes, our brains are subconsciously on the lookout for information that supports our beliefs. This information will jump out at us, while the contradictory information we may not notice at all. The stronger the belief, the more biased we become. When you believe that birth is going to be painful, dangerous, frightening or hard, your brain will set to work in the background, trying to find evidence that this is true. Unfortunately, the sympathetic nervous system, which is responsible for the fight or flight response, doesn’t differentiate between real and perceived threats. Think about a time you were watching a scary movie. Even though you know that the situation is not actually happening, chances are you felt the physical changes in your body associated with the fight or flight response. You might have felt your heart start to pump faster, you may have felt more alert and jumpy and your breathing would probably have become shallower. The same is true for a laboring woman, except this time, the effects are much more painful. When fight or flight mode is activated (by real or perceived danger), the uterus muscles start to work against each other, and the blood is diverted from the uterus to the large muscle groups of the arms and legs. Her body essentially tries to shut down the labour so that she can get to safety. This would be really helpful if we did need to run to safety or fight a predator, but is definitely not helpful when the uterus needs that blood supply to perform its important role during the labour. Sometimes fight and flight response does succeed in completely stopping the labour, but more often than not, the result is a long and slow labour with painful but ineffective contractions. And so the self-fulfilling prophecy is complete. The fearful mother searched for evidence of danger (why did that machine beep? Why did the midwife make that face? ), the ‘evidence’ she found caused her autonomic nervous system to activate fight or flight mode, her labour became painful and she was proven right. But it doesn’t stop there either, this woman will now share this experience with her friends, cementing their negative beliefs about birthing and setting them up for the same vicious cycle of fear, tension and pain. By contrast, the mother who has worked on her beliefs and has confidence in her ability to birth will be seeking out any evidence that birth is safe and manageable. The evidence she finds will help her to relax and stay calm and focused, and her birth will be much more pleasant. As birth providers we have an important role to play in supporting the mother to examine their beliefs about birth. Identifying unhelpful or limiting beliefs is the first step in the process, and once this is done she can begin to replace those with more accurate and helpful alternatives. The effort put into this preparation is well rewarded when the mother can fully relax into her birth and avoid the pain of a fearful birth. 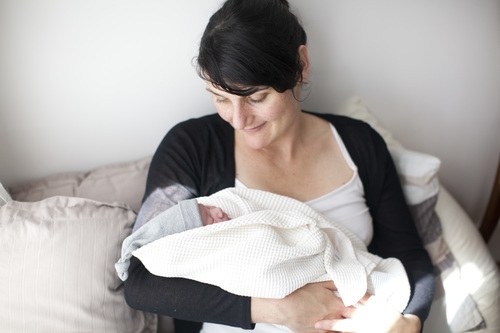 Esther Croft is a HypnoBirthing Childbirth Educator based in Auckland, New Zealand. She is a proud mother of two beautiful boys, both of whom were born using HypnoBirthing techniques. i. Green, J.M., Expectations and Experiences of Pain in Labour: Findings from a large prospective study. Presented at Tenth Birth Conference, Innovations in Prenatal Care: Assesing Benefits and Risks, October 31-November 1, 1992, Boston.